Some of Goa’s best places are usually hidden away in quiet alleys and even google maps doesn’t make locating them any easier. But if you are a determined seeker, you’ll be rewarded. We were rewarded too for our efforts when we went hunting for Eva cafe a couple of years back. 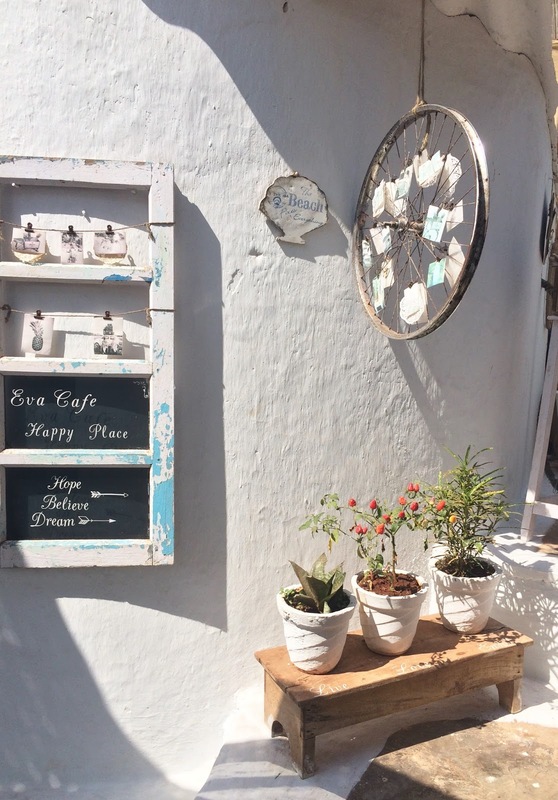 Located on a narrow lane, dominated by the more attention seeking colourful shops selling beach clothes and other baubles, Eva cafe makes no attempts to pull you in with garish or whacky decor. But the moment you step in, you just cant miss the charm this place exudes. Eva cafe is run by an Israeli lady Eva, who fell in love with Goa (like we all do! ), and started this dream project of hers in 2015. The cafe has simple decor with bare wooden furniture, easy chairs and white washed walls with a hint of blue here and there. The walls are adorned with quirky frames and there is this mediterranean style music that is played, punctuated by the sound of the waves hitting the rocky beach. My favourite piece of decor here are these cute mats that are not only pretty but are eco-friendly too. I remember relaxing on the easy chairs, gazing at the waves, sipping on a mug of delicious hot chocolate. A lovely beach in goa and chocolate - a deadly combo that can never go wrong, aren't they? We have gone there on a morning to enjoy a scrumptious breakfast. We have gone there to spend a lazy noon by the sea and we have been there to spend an evening watching the sea, as the sun went down and the moon came up in its place! Thinking back, I think it was one of those perfect moments, whose memory stays etched in our minds to this day. The cafe focusses mostly on healthy food but this doesn’t mean you cant pamper your taste buds. All their smoothies and shakes are very good and their coffees are extremely good. The Mediterranean style wraps, hummus, pancakes, avocado sandwiches and their poached eggs are some of our favourites here. This is a vegetarian friendly place and they serve alcohol too. 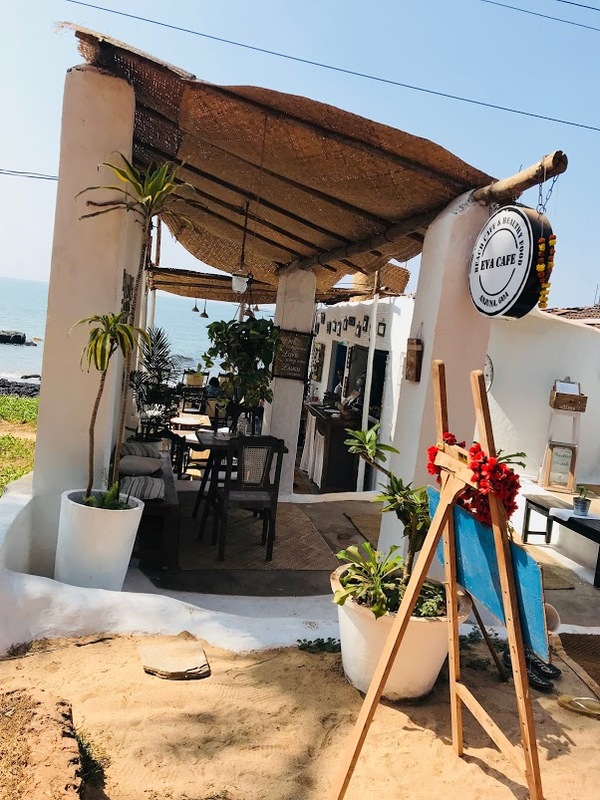 Perfect place for weekend breakfasts or brunches but you can also visit in the evenings to catch the beautiful sunsets with a mug of beer or some iced tea. Eva cafe is the perfect getaway from the crowded touristy side of Goa. A soulful and happy place to relax and refresh. 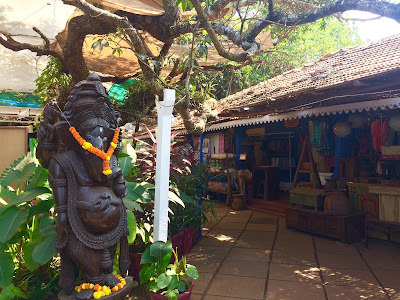 So spare some time to spend an evening or two on your next Goa vacay at this happy little cafe!